You’d like to have a shaded space in your yard to get together with family and friends, somewhere to relax and perhaps knock back a cold one. The deck and the patio are nice, but they’re exposed to the elements and it’s a bit punishing to sit there for very long in the hot sun. How about a pergola? Or a gazebo? Both are open structures that allow for a view of the surroundings while offering some protection from the direct rays of the sun. But there are differences between them. Gazebos are generally round, hexagonal or octagonal. Gazebos have a solid roof of a multitude of styles and configurations. The materials used to create the roof are as diverse as those for houses, including all the variations of shingles, metal roofing, clay tile, slate, and shakes. Gazebos are most often free-standing structures. The historical use of gazebos stretches back some thousands of years. The root of the word “gazebo” is “gaze”, a point from which to view the surrounds. Gazebos were originally built as rooftop structures for use as watchtowers against invaders. The Egyptians are credited as being the first to erect gazebos on the ground, generally to facilitate the growing of vines and other climbing plants. Other cultures adopted gazebos for use as public and private meeting places, and this historical use still holds true today. Ornate gazebos in public parks are popular venues for weddings and other celebrations. Gazebos in private gardens are, of course, generally much smaller than those in public places but still serve as a useful and aesthetically pleasing landscape feature. But, unlike the ancient Greeks, most people don’t construct them from marble. Contemporarily, permanent gazebos are more usually made of vinyl, metals, or wood. Gazebos have proven to be a good idea that caught on and continued through to today. 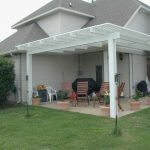 Pergolas are generally square or rectangular in shape and have an open roof consisting of beams and rafters. Pergolas are not unlike arbors in that they are both built with posts that support an open roof and both can be trellised to provide support to vines. But arbors are generally freestanding structures that serve as an ornate entrance to part of a yard or garden. Pergolas are often, but not always, attached to a house to create dappled shade over a deck, patio, or other area. The word itself comes from the Latin pergula which means “projecting roof”. Pergolas can also function as a shaded passageway between areas of a garden. Creating a shaded area that’s pleasing to look at is not exactly a new idea. The earliest recorded garden plan that included a pergola at its entrance survives from about 1400 BC and belonged to an Egyptian high court official, whether for aesthetics or protection from the elements is not clear. Pergolas are often used to support vines and plants such as climbing roses, flowering vines and grape vines, creating an atmosphere reminiscent of Shakespeare’s oft-quoted “Quite over-canopied with luscious woodbine, With sweet musk-roses and with eglantine” (from A Midsummer Night’s Dream). You don’t necessarily have to keep the roof of a pergola open. Some people choose to cover them so as to maximize their shade area. Waterproof canvas covers, some of which are retractable, are popular. Covers are also available in clear plastic made of polycarbonate, plexiglass, or acrylic). Solid metal or wooden roofs for pergolas are not unheard of. redwood. Many of the woods are lovely but can, frankly, involve a great deal of work for the homeowner. Any cuts, chips or dings incurred even in normal wear and tear should be puttied and touched up with stain and sealer. Pressure washing, re-staining and resealing of the entire structure is recommended at least every two years to maintain the original color. Wooden structures are susceptible to such evils as insects and rot, making for a shorter life span than, for instance, a composite. Composite lumber is a material that combines recycled wood fibers and plastic. It has the look and feel of natural wood but without the maintenance that wood demands. There is never any need to stain, sand, or paint a composite. It is highly scratch and stain resistant, water resistant, fade resistant, mold resistant, impervious to insects and unlikely to split or delaminate. For all these reasons, composite has a longer life span than natural wood. And all of this without sacrificing the look. For beauty, resilience, longevity and ecological sustainability, composite is the number one choice. Whatever style you choose, there’s no question that you’ll be adding beauty and functionality to your outdoor setting and value to your home with a pergola. Whatever your indoor or outdoor construction needs are, call Sunshine Sunrooms for the very best in design, materials and workmanship. Call today at (972) 243-5390.